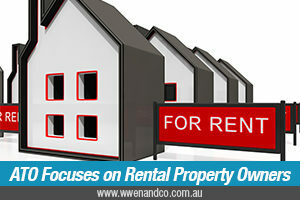 Rental Property Owners – ATO Is Watching You! The Australian Tax Office is strongly recommending that rental property owners closely examine the information on its website to make sure they are really clear about their obligations to get their tax claims right in 2016. Assistant Commissioner Graham Whyte said the ATO would be paying close attention to excessive interest expense claims and incorrect apportionment of rental income and expenses between owners. We are also looking at holiday homes that are not genuinely available for rent and incorrect claims for newly purchased rental properties. If you are claiming deductions for your rental property, be sure to include all your rental income and make sure that your property was genuinely available for rent when the expense was incurred. John had a newly purchased rental property that had not returned any rental income. He told the ATO that the property was occasionally advertised on community noticeboards and websites. Rental property owner Sarah reported high rental interest claims and was required to provide bank statements as evidence to the ATO. The statements showed borrowings well in excess of the purchase price of the rental property. The interest charges relating to the private part of the loan were disallowed. Sarah was required to pay more than $15,000 back to the ATO. Nancy had inappropriately claimed a deduction for repairs to defects present in a newly purchased property and the capital works and borrowing expenses should have been spread over several years. Nancy also provided false receipts for property management fees undertaken by a family member. Ethan was required to provide evidence to the ATO to show that their property was genuinely rented at market rates. He was unable to provide any documentation to show that a rental arrangement was in place.